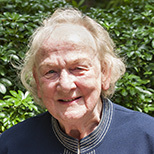 Baroness Margaret Sharp is an Honorary Doctor of Applied Sciences at LSBU. A distinguished academic and passionate campaigner on issues including tuition fees and vocational education, she spent a significant part of her career at University of Sussex, supporting the early development of biotechnology and encouraging investment in science. Read more about Baroness Sharp.